“Short-sightedness” is a crime against oneself… I’m not sure where I heard that but this kickstarter project and article reminded me of that saying. Ok so it may be more accurate to say “some” Brooklyn communities, but I definitely see this problem in many Black Brooklyn communities. When 4w circle of Art and Enterprise closed I tried getting artist together to do this. I was inspired by my experience with one Smith Street group in the late 1990’s as well as my history of these. Why can’t the black community work together. Why can’t creative get together, use the empty spaces as temporary spaces for creative businesses thus stimulating growth. In short they’ve organized to facilitate creatives BKSTYLE! I was so happy to discover them NOW maybe Black folks will listen. (Yes I said it). 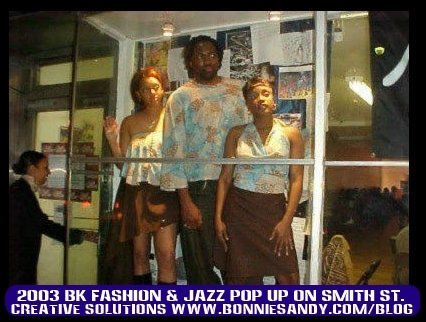 The Brooklyn Fashion is Known for popup shows and sales at local bars and lounges esp unused/low night hours at a bar for Parkside Lounge for performance and rehearsal space . Strangely these were abandoned by creative seeking the more LES type “boutique” space. Federal Plaza, brooklyn Musem, madaba’s Outpost … all have seen our footprints. yes We find we lack the press opportunities but we still pull a crowd – The fact is rather than support and share efforts, others soon “copy” there are No boundaries, the press is activist, business person. Hunger has a way of clouding judgement. Disadvantage communities are Hungry. Space is Not the only problem. Putting those who practice a model with issues isa tough way to create change. I had to,in the meantime focus on developing an entrepreneurial program and plan as well as other aspects that are needed. Our main focus was on a creative entrepreneurial program and developing change management services. We focus on “WHY creatives were not selling”, but I’ve learned that a creative entrepreneurial curriculae is needed to enhance these space solutions. True, I have been saying this since 2003/4 to other desigenrs and crafters. Most people I’ve shared it with soon decided they needed to run a “space” or an incubator, focusing on the real estate value and ignoring the broader issues and viewed RENTAl as their primary income. Thus sending these spaces back into the impractical “unaffordable” realm. We went to local politicians(ok my late partner Paul dragged me.) It is simply one aspect of a larger solution. It is at the core of The TIBIAETECH solution. Look I’ve been open with SEVERAl stakeholders… some in Real Estate about using open empty store fronts and building. I even have an strongly developed business plan… But as soon as they consider it and see the numbers. “ownership and control become an issue. We do not own the properties and those who own properties do not care about long term development. We cop outon great ideas… and wait for someone else to do it first. … and lastly cannot forget that Crab in Barrel syndrome… if you do not know this I’ll spare you the details. Posted in Latest and tagged Creative Industrialism, Tech Evangelism, Virtual Incubator.